Setting up the Adafruit Feather M0 Wifi with a pHSensor running in Microsoft Azure « Adafruit Industries – Makers, hackers, artists, designers and engineers! Thanks to Marten for sharing with us! Via Channel 9. It’s time consuming, costly, and difficult for growers to measure and regulate pH throughout the day and across the lifecycle of a plant. Indeed pH levels are one of the key factors in plant health. Furthermore pH levels in the water and nutrient streams change constantly. To increase plant health via nutrient uptake in turn promoting higher yields, pH needs to be more closely monitored and adjusted in real time. This video helps you Implement the Microsoft Azure IoT suite, to get real time monitoring of the fluctuation in pH levels – of both influent and effluent water flows from the hydroponics system – in turn leveraging the Microsoft Cloud to identify and send messages around optimal pH levels over time. Such data will be streamed, displayed, and allow for remote-monitoring by growers. Discrepancies will be identified and send to the growers phone via Twillio so corrective action can be taken. Azure is Microsoft’s cloud solution for IoT projects. Azure is a comprehensive and flexible program from the Microsoft team that they’re extending into the open source hardware world. 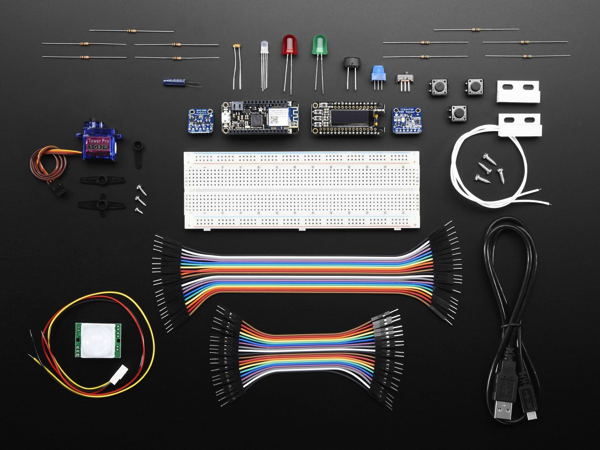 This starter kit includes a pre-soldered Adafruit Feather M0 WiFi with stacking headers, a FeatherWing OLED, and some sensors and components to get you started on your IoT journey. Read more.